The design of the present écuelle was conceived in 1781 in honor of the birth of the Dauphin. 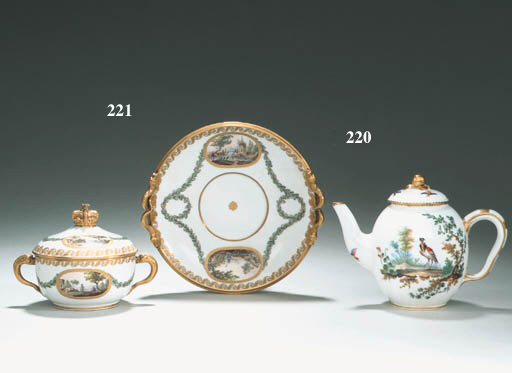 Hard paste porcelain was developed at Sèvres in 1769 but not in general use until 1772. It is interesting to note the high quality of painting on the present example, as the technique of decorating on hard paste was reletively new. The Sèvres records for the decoration kiln of 25 March 1782 list two ecuelles Dauphin 4e [grandeur] painted by Rosset and gilt by Boulanger with 'paysages et fleurs'. The present example is likely one of these two.